Once a classic, always a classic! And these Dr. Martens® Vintage 1461 Made In England boots are no exception. Part of the Made in England Vintage collection which are handcrafted by Dr. Martens' Northamptonshire factory cobblers using original construction techniques. Quilon leather upper is made of a thick and full-grain leather with a matte finish and only gets better with age. Lace-up eight-eyelet boot with fabric laces and tonal eyelets for a secure fit. 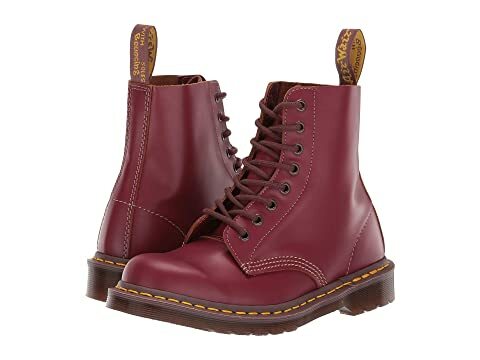 We can't currently find any similar items for the Vintage 1460 Made In England by Dr. Martens. Sorry! The UK vintage Dr. Martens are well worth the additional cost. Besides them looking absolutely perfect down to the fine details, they're very comfortable. I found them to break in very easily with out any discomfort or blisters during the first week or two of wearing them. I typically wear a 7.5 in men's shoes and went with a size 8 in these, and they fit well with thick socks. I think a size 7 would have been slightly too small and uncomfortable. This is an outstanding boot in both looks and comfort. It took about a month of wearing them 2-3 times a week to break them in as I was unable to wear them every day due to extremely painful blisters on my heel. The break-in period was very taxing but once broken in these boots are amazing. They hold a shine very well and the sole is very cushioning. I\'ve only had them for about three months so I can\'t speak on their durability but they appear to be holding up fine so far. I\'ve seen some commenters complain that these boots fall apart when used as work boots; in my opinion these are dress boots and not work boots. They\'re good for walking but I wouldn\'t wear them all day in a lumber mill. Torture for a week, then they feel wonderful. Look is fantastic. Hopefully they hold up better than the series of Chinese Docs I went through (whereas the made-in-England pair I bought in '96 held up for about 6 years of daily wear). The shoes look great. The Oxblood is a little closer to cherry red than I remember, but they're breaking in nicely. The only issue is the short strings. Zappos shipped it out overnight for free. This is my fourth pair since 1984, I hope they hold up as well as the others. These Docs are just like the ones I wore back in the day! They are of excellent quality and workmanship. After the break in period, they are the most comfortable shoes I own. I'm on my feet most of the day, and I experience less fatigue and back pain since I began wearing these.It's too bad there is such a premium to pay for the quality, but there is a big difference.